Family PowerSports Lubbock 65cc give away! 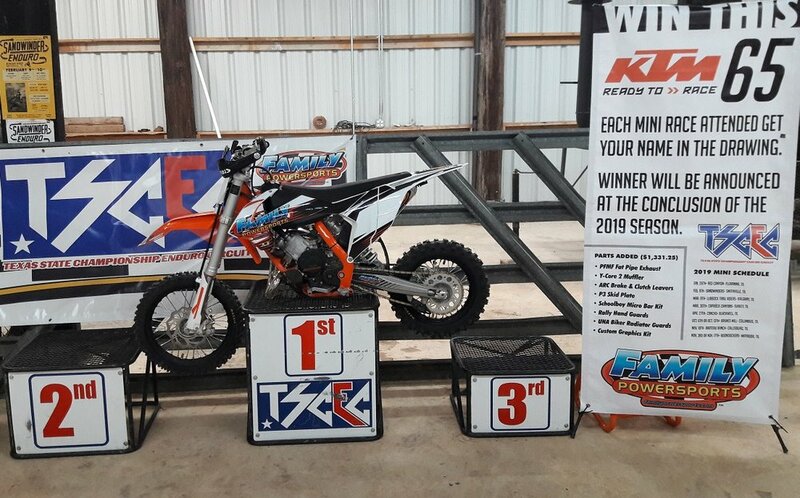 TSCEC is excited to announce that a KTM 65cc will be given away to one lucky participant of the 2019 mini season. Thank you Family PowerSports Lubbock for your generosity! The more races a mini rider participates in, the higher the odds of winning. A random drawing will determine the winner during the TSCEC banquet for the 2019 season. Not ready for a 65cc, or need an 85cc? Family PowerSports Lubbock has you covered. Family PowerSports Lubbock will take the 65cc as trade-in and help you get the bike you need. Only TSCEC points paying mini races will qualify as an event eligible to receive an entry for this sweepstakes. Entrants must meet the requirements set forth in the TSCEC Mini Rulebook. Riders participating in multiple mini classes will receive one entry only for the entire event, not for each class raced. Winner will be determined by a random drawing during the TSCEC banquet for the 2019 season. Winner is not required to be present during the random drawing to win. Winner has 10 days to respond. Winner will be required to have a guardian/representative (18 years old or older) help coordinate taking possession of the prize. If winner is not present during the banquet to take possession of the prize, winner is responsible for taking delivery of the prize of within 20 days of the drawing. The prize must be picked in Lubbock, TX. The winner will be responsible for all taxes, titling, and registration fees. Prize is awarded “as is” without any warranty or guarantee, either express or implied. TSCEC is the governing body responsible for this sweepstakes and the administration of the rules set forth for this sweepstakes. Failure to meet any of the requirements above are subject to disqualification. In the event of a disqualification and new random drawing will be held and a new winner will be notified.